A focus on year-over-year cost increases is a necessary component of prudent budgeting for both small local practices and large national healthcare systems. However, now more than ever, cost containment is a priority for healthcare administrators. Overhead facilities costs have often been the last place for healthcare organizations to look when evaluating expenditure. Assessing utility use and improving energy management is a simple way for healthcare facilities to impact their bottom line and improve overall efficiency. Insulation on your hospital’s mechanical systems is often out of sight, out of mind. Unfortunately, this can mean that the insulation is not performing as intended. In fact, it is estimated that up to 30% of all installed mechanical insulation is either missing or damaged due to inadequate or irregular maintenance. During a time when healthcare facilities are focused on saving as much as possible, large capital investments are difficult to justify. An insulation energy audit, on the other hand, is a low-hanging fruit when it comes to maximizing the performance of your hospital’s exiting mechanical equipment without expending a large amount on equipment upgrades. An insulation energy audit gives staff, building owners and facilities managers a complete understanding of the true dollar and performance value of their insulated systems. The process is an effective way to calculate how much money and energy a facility is losing with its current mechanical insulation system, whether because the mechanical equipment is under-insulated, or because the insulation is missing or damaged. Then, once the vulnerabilities have been identified, a plan can be developed for updating the insulation to be as effective as possible. Many hospitals use recommissioning or retro-commissioning to ensure their plants are operating correctly. Although this strategy can improve performance, the results are static, only correcting issues at one point in time. A more effective approach is constant commissioning. This will provide complete transparency and ensure your systems are running properly, 24/7. With a more traditional system, the wait time between commissioning could be a year or longer. In that time, equipment ages, degrades, and goes through many other variables. With constant commissioning, operations personnel can be notified immediately if something is wrong, rather than waiting an unknown amount of time. Through continuous monitoring, constant commissioning provides full transparency into the efficiency—or lack of efficiency—of a given piece of equipment. According to the National Conference on Building Commissioning, a constantly commissioned facility can use significantly less energy than a facility that is recommissioned every two years. It’s time for hospitals to think of energy management solutions not as an additional expense, but as investments that will deliver true ROI in the form of energy savings. Your organization has already made a significant investment into HVAC and other mechanical equipment. Start by optimizing your hospital’s existing energy use to protect your current equipment and keep it in peak condition throughout is life. No matter the age of your system, you can start conserving energy by maximizing what you already have in place. To do this, your facility will need to commit to preventative maintenance (PM). By making PM a standard part of your operations, you can become aware of issues before they become more costly problems. 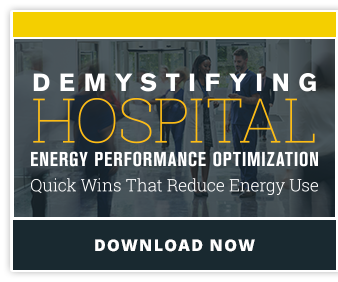 Energy optimization in hospitals does more than impact the bottom line. Each aspect of facility operations plays a role in delivering superior patient care. Go after these three low-hanging fruits to start the process of optimizing your hospital’s energy management today.